For some people, finding a calling in life can provide hard. But, for Heather Good, she knew by the age of nine, after being in a local production of “The Nutcracker”, that she had a love for the performing arts and that she would someday work in the field. She didn’t know where or how, but she knew she had to continue to spread the joy theater brings. Today, Heather serves as the assistant director of administration, outreach and development for the Wisconsin Union Theater in the Wisconsin Union. What exactly does that mean? It means she does a whole lot to spread performing arts joy, including everything from helping clients book theater spaces at Memorial Union to driving musicians from around the world in a van for the World Music Festival. Here is a behind the scenes (or, better yet, a behind the curtain) look at Heather Good. What work were you doing professionally before you joined the Union team? Well, I started working at the Union while I was a graduate student, in the Bolz Program for Arts Administration, as a program advisor for the Wisconsin Union Directorate Art Committee and a committee that was called Student Performance, which were both Union student-led committees. Prior to going to graduate school, I worked for the Madison Boy Choir as their choir manager, and, after I graduated from UW, I worked part-time for Opera for the Young, which does opera programming in elementary schools, as their development director and part-time at the Union. What does a typical day look like for you at the Union? I wouldn’t say any day is typical here. And that’s part of what I love about the work. I mean, seriously, I’ve been in my current role here for 11 years now, and I am still learning new things all the time. I’m still getting requests that I’m like, huh, I’ve never been asked that before or we’ve never tried that. And that for me is totally part of the interest in the work. But, often, many of my days involve talking to people who want to host an event in one of our spaces and helping them through some aspect of that process. What does a special event, like the World Music Festival, look like behind the scenes? 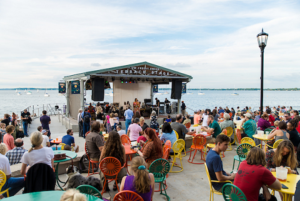 Members and guests enjoy music from Rajab Suleiman and Kithara on the Memorial Union Terrace during the Madison World Music Festival in 2016. The World Music Festival is an unusual event for many reasons. It’s a multi-day event. We have things happening on the Memorial Union Terrace, and we have to go over to the Willy Street Fair for our Saturday programming. For me, the World Music Fest has a lot of work leading up to it. Money has to get raised, fleet vans have to get reserved, hotel rooms have to get reserved, food has to get ordered, t-shirts have to be ordered, and there are all these different teams that have to be ready to set the stage and make sure that all of the background stuff is ready to go. If there is any big theme about our work, it is you can’t do it alone. What do you like the most about planning events in the Wisconsin Union Theater? I totally love working with all of the students. Whether it’s a registered student organization that is planning an event or part-time employees that are working with us or members of the Wisconsin Union Directorate Performing Arts Committee. I get to work with so many and such a huge variety of students from all backgrounds. One of the great things about the Union is that you don’t have to be an arts major to do arts work here. So, I not only get to work with arts majors, but I also get to work with engineering students, business students, nursing students, you name it! What would be one thing that would surprise people about your job? Oh gosh. I think it would surprise people maybe to know the huge variety of requests that I get. You know, people want to light things on fire on stage. They want to bring live animals up on to the stage. They want to cook food on the stage. And there are often ways that we can allow those things to happen, but each of those scenarios has a whole constellation of policies and other procedures that have to be attended to. So, my job is ensure we follow the rules but also do the out of the box thing that we want to do. What is your favorite event to do work for behind the scenes? World Music Fest would definitely be near the top of that list, because I love meeting the artists. I usually drive a fleet van during the festival, itself, so you just get to talk to people, and it’s really fun. To see Heather’s work in action, check out an upcoming Wisconsin Union Theater performance. More information about upcoming events and about the Theater is available here: union.wisc.edu/visit/wisconsin-union-theater. You are also welcome to learn more about Heather through the Wisconsin Union Theater’s video below.